Glycoglycerolipids (GL) of the red beet vacuolar membrane under osmotic and oxidative stresses have been investigated. Variations of the GL content under stress conditions might be indicators of an important role of these compounds in protective mechanisms. 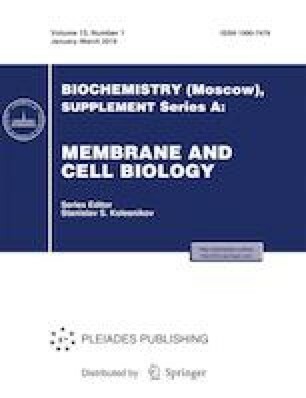 Changes of the GL levels and the digalactosyldiacylglycerols/monogalactosyldiacylglycerol (DGDG/MGDG) ratio in the vacuolar membrane under hypoosmotic and oxidative stresses corresponded mainly to those observed in other cell membranes under majority of stresses studied, namely, the ratio increased that contributed to membrane stabilization. The changes of the GL content of vacuolar membrane caused by hyperosmotic stress notably differed. The DGDG content and DGDG/MGDG ratio significantly decreased. These alterations did not necessarily result in a decrease in the membrane stability under hyperosmotic stress, since the content of MGDG involved in the formation of a hexagonal structure and capable of destabilizing lipid bilayer also decreased. The changes of the GL level in the vacuolar membrane under hyperosmotic stress can be due to an increased degradation or reduced biosynthesis of GL; these changes may represent yet another defense mechanism of a plant cell against stresses. Abbreviations: GL, glycoglycerolipids; MGDG, monogalactosyldiacylglycerol; DGDG, digalactosyldiacylglycerol; SQDG, sulfoquinovosyldiacylglycerol. The work was performed on the equipment of the CSU “Bioanalytics” of the Siberian Institute of plant physiology and biochemistry SB RAS (Irkutsk).